Array formulas are one of Excel’s most powerful features. If you’re familiar with array formulas, you’ll be happy to know that you can create VBA functions that return an array. Let’s start out with a simple example. The MonthNames function returns a 12-element array of — you guessed it — month names. 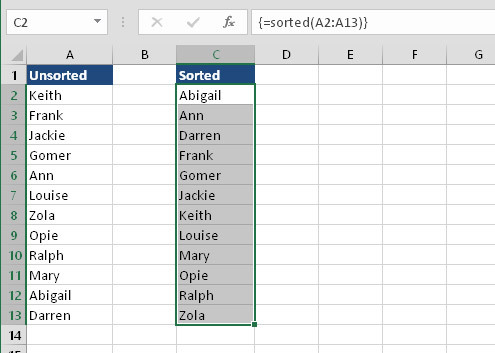 To use the MonthNames function in a worksheet, you must enter it as a 12-cell array formula. For example, select range A2:L2 and enter =MonthNames(). Then press Ctrl+Shift+Enter to enter the array formula in all 12 selected cells. Check out the result. Using the MonthNames function to return a 12-element array. You can also pick out a single month from the array. Here’s a formula (not an array formula) that displays the fourth element of the array: April. Suppose that you have a list of names you want to show in sorted order in another range of cells. Wouldn’t it be nice to have a worksheet function do that for you? Using a custom function to return a sorted range. The Sorted function starts by creating an array named SortedData. This array contains all the nonblank values in the argument range. Next, the SortedData array is sorted, using a bubble-sort algorithm. Because the array is a horizontal array, it must be transposed before it is returned by the function.